Peel and chop mangoes roughly. Drop it in the mixie and puree the fruit without adding water. Take a pan and add the mango pulp and sugar to it. Mix well in medium flame until the sugar dissolves completely and the pulp becomes slightly thick and jammy. It should be easily spreadable. Remove from heat and allow it to come to room temperature. Fill it in a sterilized bottle and store it in the refrigerator and use. This can be preserved for 6-8 months. Serve this is a sidedish with poori or spread it on chapathi and roll it. Take a pan and add the mango pulp and sugar to it. Mix well in medium flame until the sugar dissolves completely and the pulp becomes slightly thick and jammy. At this stage add the ghee and mix well. Keep stirring for about 15 mins to make a thick paste. It should come to halwa consistency. 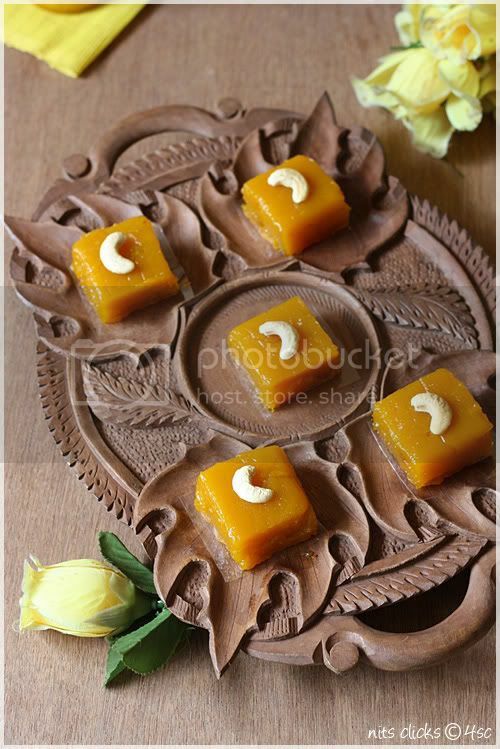 Once you reach that stage, switch off the stove and pour the halwa on a well greased square mould. Allow it to set for an hour atleast at room temperature. Later cut squares and decorate with cashews. This quantity would make around 9 large squares. Store in refrigerator and consume it within 15 days. Avoid using hands while you handle mangoes that are to be stored for long. Use kitchen gloves while chopping the mangoes. Sterilize the bottles that you use for storing the spread. Use the same quantity of sugar even if your mangoes are sweet. The sugar acts as a preservative here. But if your mangoes are not sweet you might need more sugar. I used Banganaballi mangoes for making these. 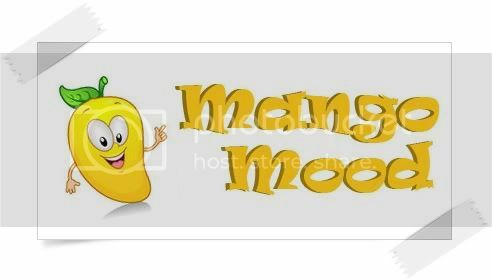 You can use any mango that is fleshy but not fibrous. For eg. varieties like Malgova will not suit such preparations. OMG..the halwa is so tempting. Perfect squares.. irresistible. I love both spread and halwa! Great colour and presentation! Lovely recipes... 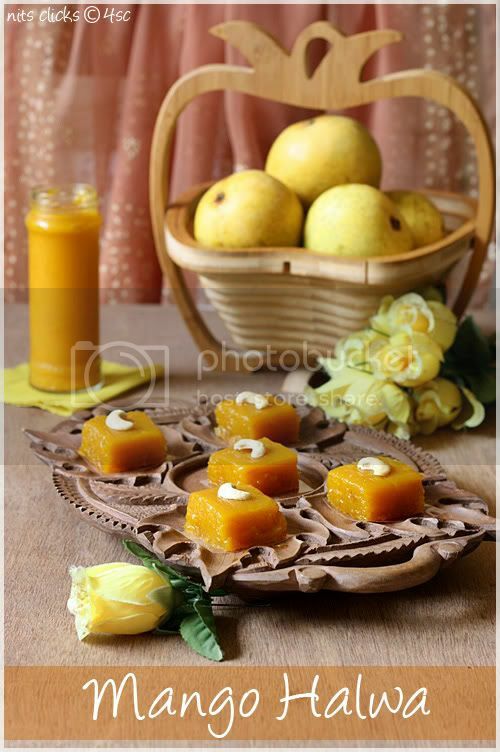 The light lilac background is so very perfect for the mango halwa..
Halwa is truly tempting..great idea. Mouthwatering Mango series. Excellent preparation. I am absolute mango lover.. 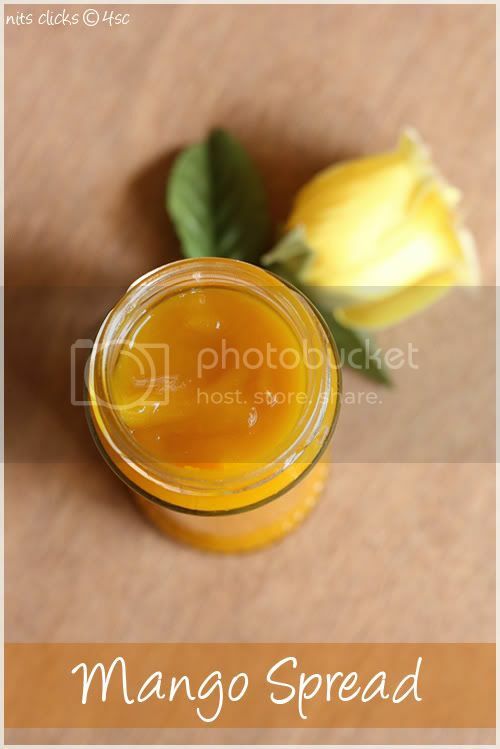 I loved the mango spread and also the parfait recipe in yr prvious post! Both looks simply out of the world, specially that spread, just drooling over that bottle..yumm! wow...so tempting halwa...perfect shaped...Thanks for sharing.. I make the spread every year too,but spice it with Cardamom or Kesar for that different taste.Love your bottle!The halwa looks delicious too! Both look great. I might try out the spread. 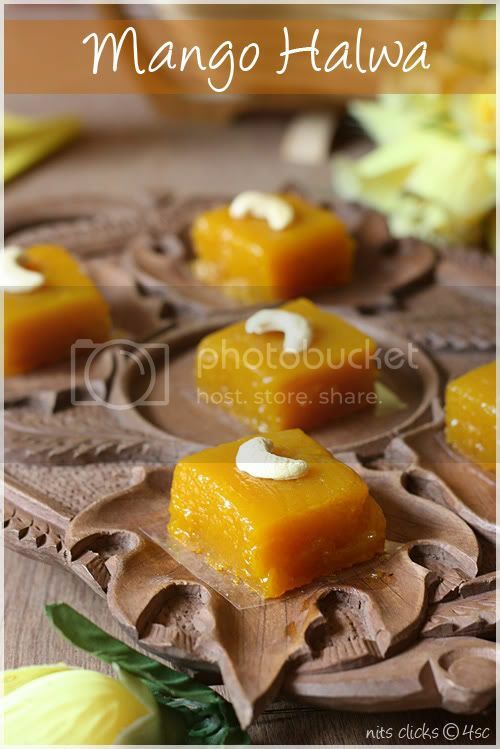 Yummy halwa..must try.gorgeous pics..the brown plate and yellow mango beautiful contrast.. 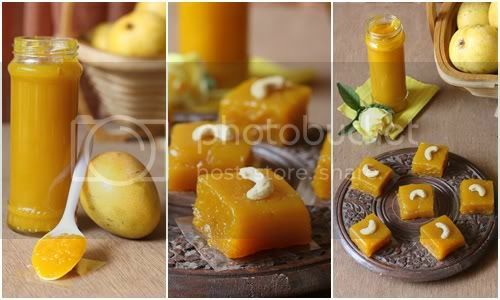 Both looks delicious nithi,mango halwa tempts me very much! lovely clicks! 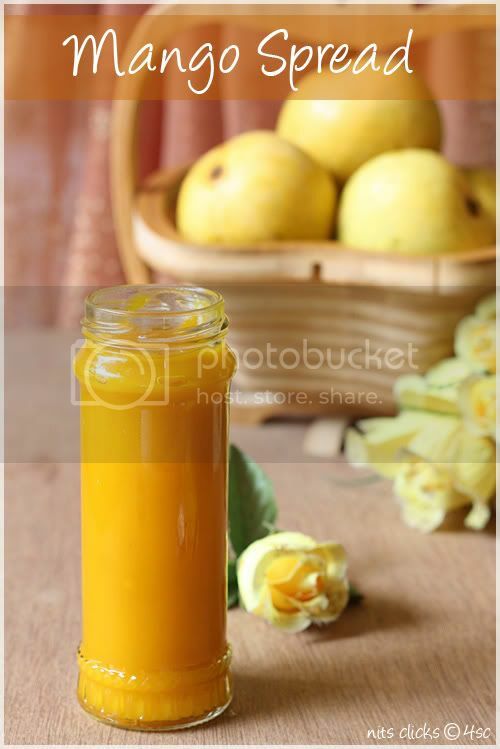 Isnt it similar to Aam ras?? The first pic is classic!!! 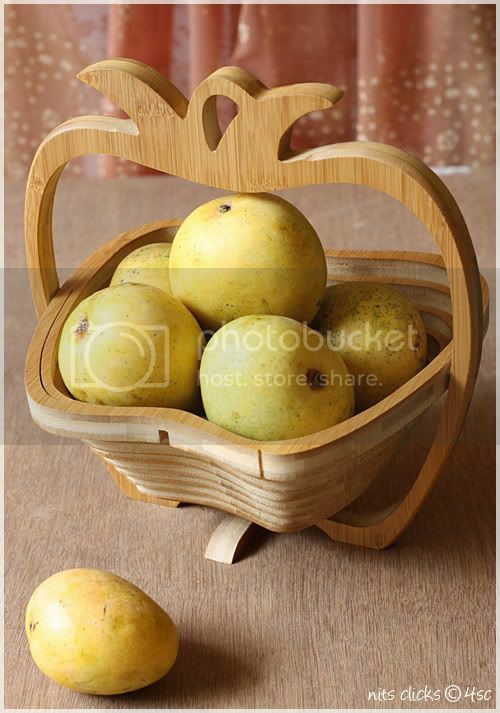 And i love that wooden tray...kaha se liya?? Lovely recipes. Tips will be useful! I'm totally craving this halwa now after seeing your post. Beautiful Nithya! Delicious and tempting looking halwa beautiful looking color u have got.